Well, a couple of days ago a three Century Drop showed up in the Cyrosphere Today measure. And it may just be something we’ve never seen before (UPDATE: actually the last time was 2008, see Neven’s comment below). 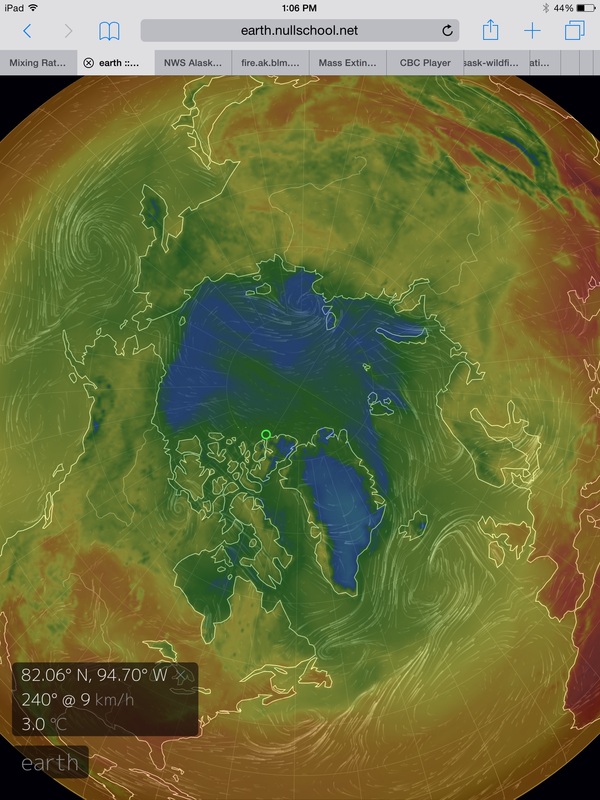 At the least, it’s an event that’s pretty amazingly rare — or it should be, without the heat added to the Arctic by human fossil fuel emissions. 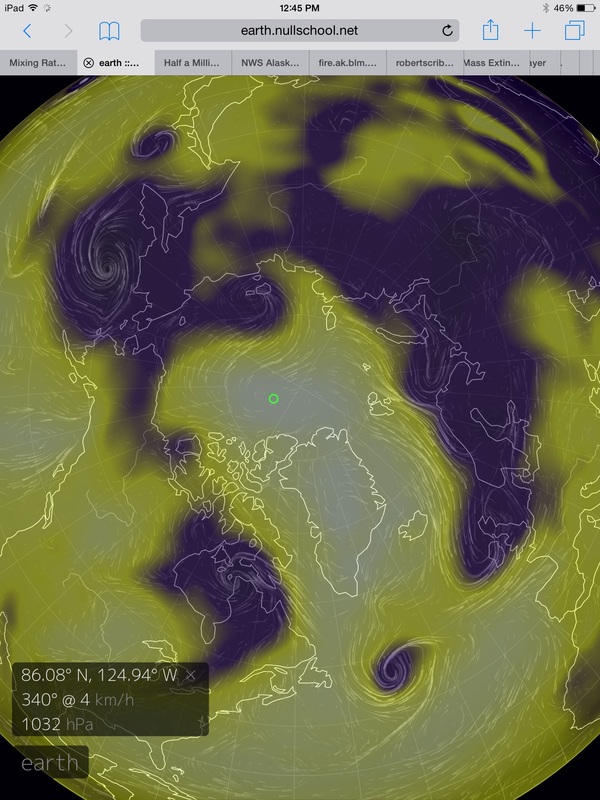 On Tuesday evening, the Cryosphere Today site showed Arctic sea ice at about 8,986,000 square kilometers. The next day the measure stood at about 8,646,000 square kilometers. That’s an extraordinary loss of 340,000 square kilometers in just one day. 340,000 square kilometers gone in a single 24 hour period. 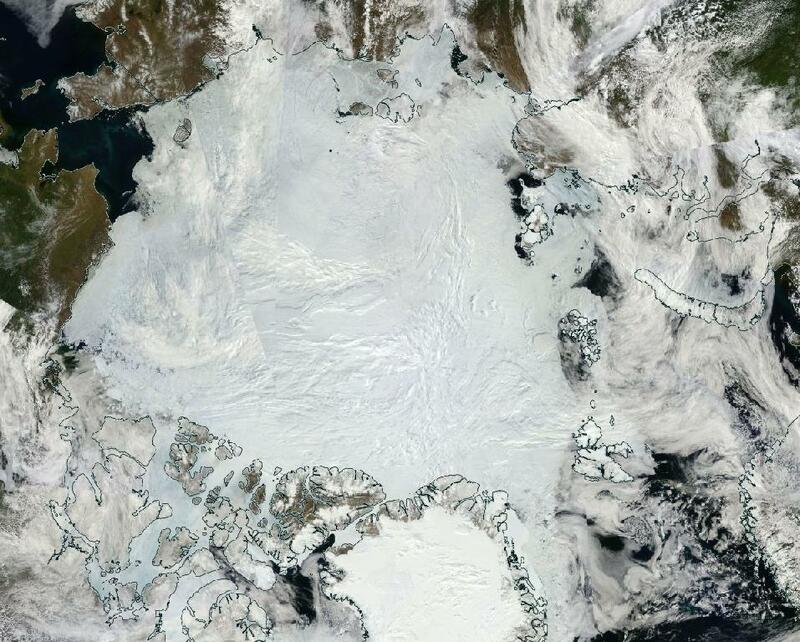 That’s an area of sea ice the size of the state of New Mexico gone in a single day. In the above graph, you can see the drop as the vertical turn in the yellow line denoting 2015. The massive single day drop temporarily brought sea ice area in the Cryosphere Today sea ice area chart into the range of second lowest on record for the date. Area losses of around 70,000 square kilometers for Wednesday resulted in a retreat to around 4th lowest on record. But any period in which drops of this size become frequent would easily transport the measure into new record low territory. The cause of such a large single day drop is likely due to a combination of factors. 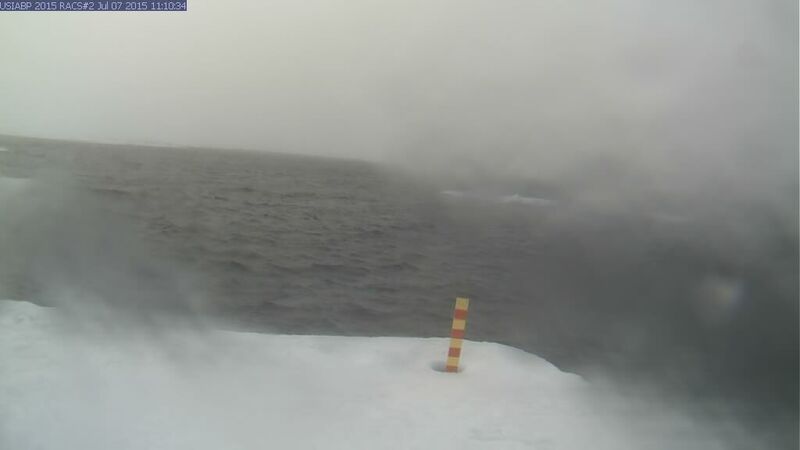 Lately, storms have been more prevalent in the Arctic Ocean proper and such storms have a tendency to spread the ice out more, opening gaps in the ice called polynyas which tends to push the sea ice area measure lower. 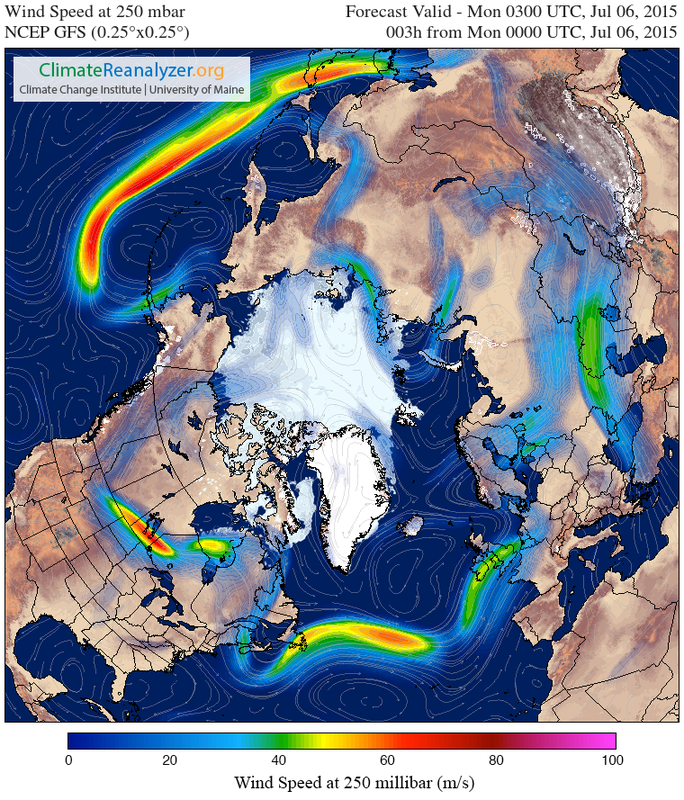 In addition, there is melt pressure now in Baffin Bay, Hudson Bay, the Kara Sea, the Laptev Sea, the Beaufort Sea, the Chukchi Sea, The East Siberian Sea, the Canadian Archipelago waters, and in the Barents border region. 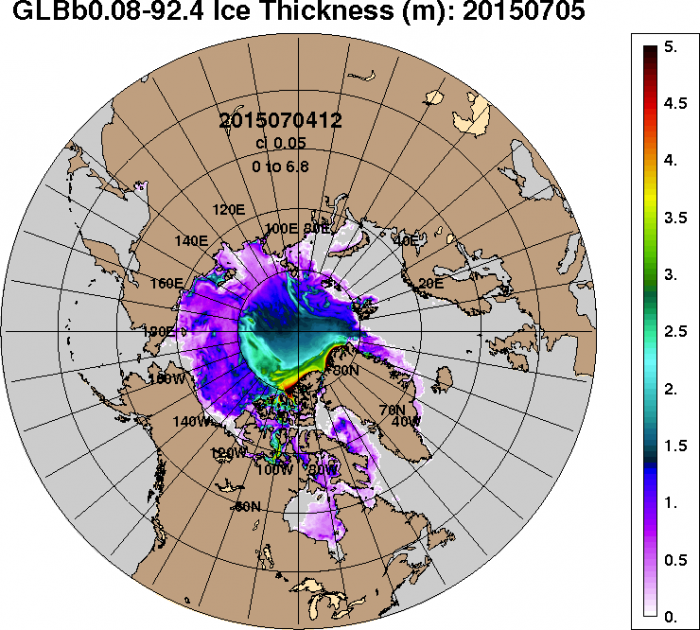 This basically composes the entire border zone of the Arctic sea ice. 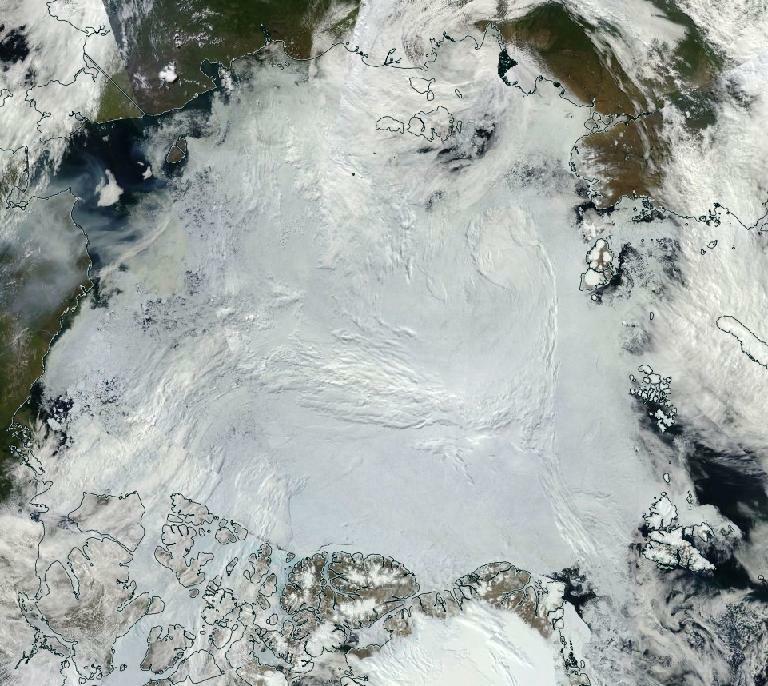 Finally, the NASA MODIS satellite composite for recent days has shown a marked shift toward a light blue coloration for the entire Arctic Ocean zone and especially for the border zones. Such a shift is indicative of a proliferation of melt ponds. 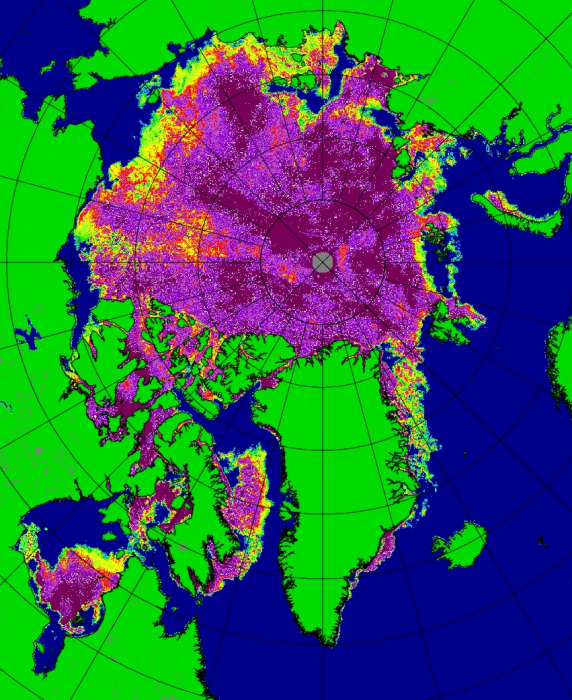 Major snow cover losses over sea ice during the past two weeks have removed insulation to the sea ice pack and probably aided in the formation of these melt ponds. 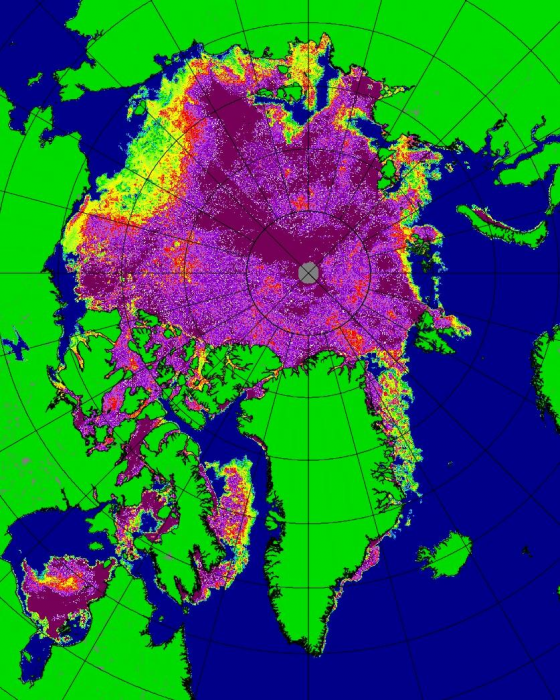 Melt ponds are a strong indicator for sea ice health throughout the melt season — so a proliferation of melt ponds at this time may be a sign of sea ice melt vulnerability (see more over at Neven’s Arctic Sea Ice blog where they do a bang-up job tracking seasonal melt ponds and their potential impacts). 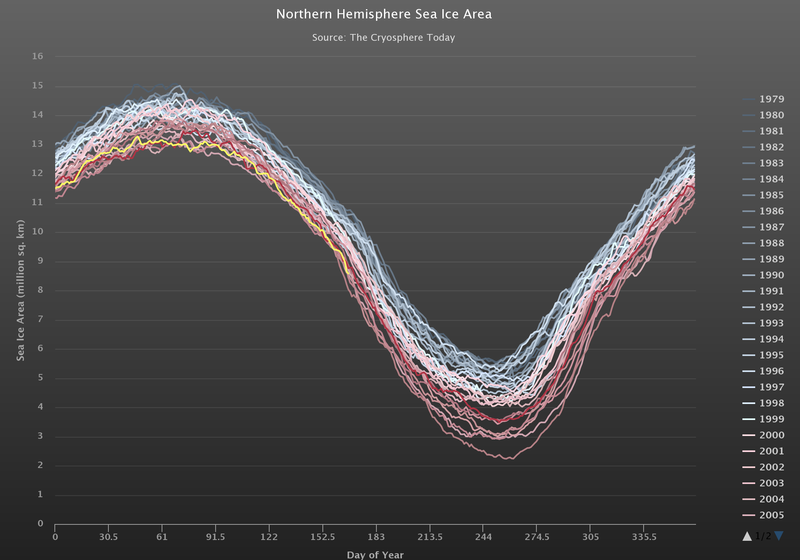 Though a three Century drop occurred, melt overall still has some catching up to do to make 2012 levels. 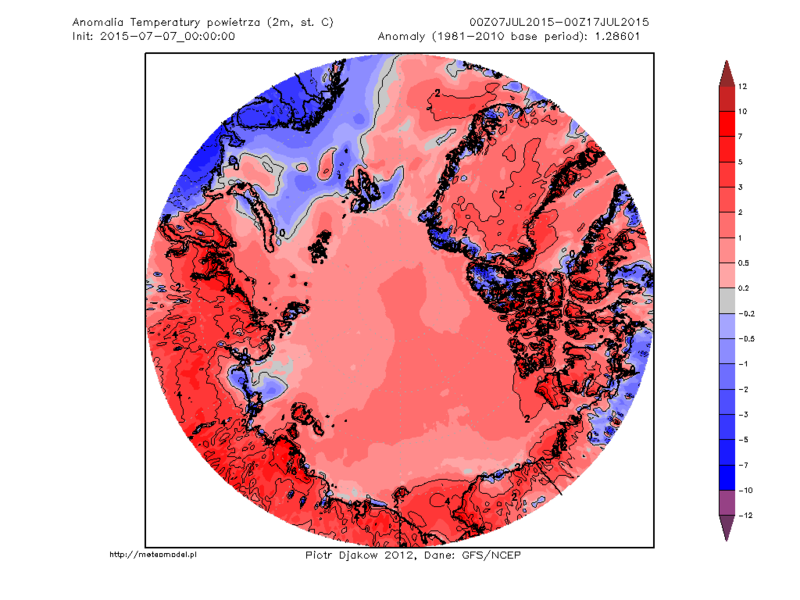 So though this massive daily drop occurred, we are not yet in the red zone for sea ice area. Sea ice extent measures, on the other hand, remain in the range of second to third lowest on record and are still very close to all time record low levels. 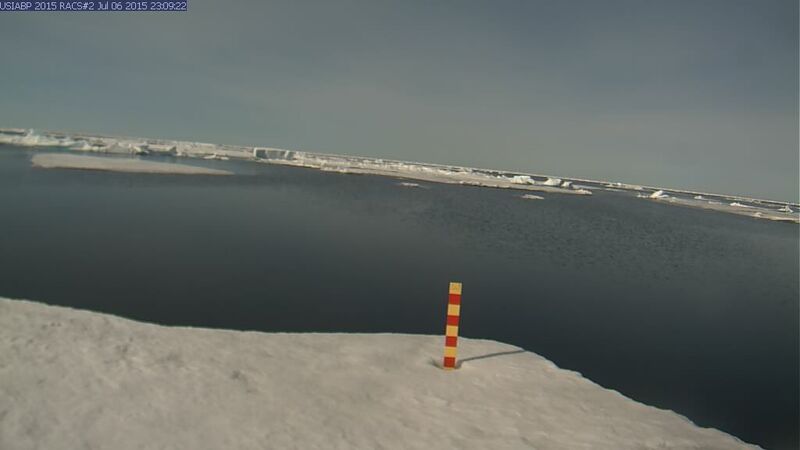 So this particular melt season is certainly one to still keep watching.